Do you remember where you were on July 27, 1954 (If you had even been born yet)? Dwight Eisenhower was President, the number one song in America was “Little Things Mean a Lot” by Kitty Kallen, people were flocking to the theaters to see Alfred Hitchcock’s latest movie “Rear Window” and Melba Smith was hired as secretary by District Lodge 776 in Fort Worth, TX. After 63 years of serving the IAM as an OPEIU member, Melba decided it was time to retire. 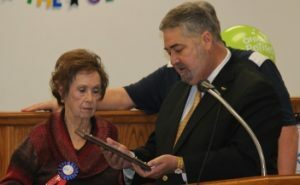 Both the IAM and OPEIU were there in Fort Worth last week to honor her hard work and dedication.